We’ve got an exciting segment for you. First of all, thanks for making us part of your day. If you’d like to come back to this episode, you can do that at GrowthToFreedom.com/181. If you never want to miss an episode, you can do that GrowthToFreedom.com/Subscribe. If you want to join in on the conversation with tens of thousands of others on Twitter, you can do that at @Dan_Kuschell. 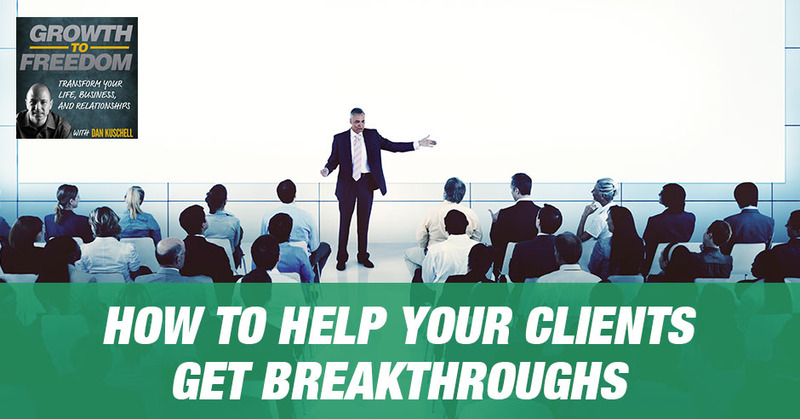 Have you ever wondered what the difference is between those experts, I call them coaches, advisors, influencers, that help their clients get huge breakthroughs and those who don’t? There are a couple of perspectives I’d like to share with you that if you’re an expert, an advisor, a consultant, a coach or an influencer, you’re going to love this session and the way it shifts the way of performing and working with your clients. When you work with a client, they start somewhere and their goal working with you is to get an outcome or get a breakthrough or get a transformation and experience. Usually between where they are and where they want to go, there’s a gap. To close that gap, we’ve got to create a bridge. There are a couple of parts to the bridge. My observations stemmed from my son, Kyler, who’s ten and he plays flag football. The coaches he’s got, these volunteer guys, they’re awesome. I love how they work with these kids, but they’re not just doing it at a surface level. Have you seen coaches or maybe work with coaches or advisors that work with you on a surface level? That’s one thing. Then it’s where the real breakthrough, the real transformation, independence comes from by helping people go deeper. It’s that deeper part that I’d like to share with you. There are three types of coaches or three ways of coaching a lot of people do. Then there’s a fourth way that I’m going to go through that is where the real breakthroughs happened overall. There are three types. The first type of coach that’s that attaboy coach. You’ve met that coach. I had coaches like that growing up as a kid playing sports, baseball, football, basketball. Attaboy-type coaches, these are the types of coaches that are a cheerleader for you or me. The second type of coach is the you-can-do-it-type coach. They are a positive thinker. They’re optimistic. The third type of coach is they’re the Debbie Downer to some degree. They take a negative framework or defeatist approach. You don’t want to do that. 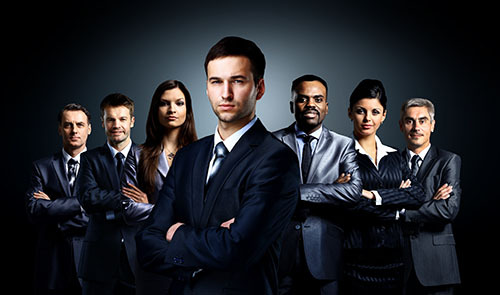 Number one is are you one of these kinds of coaches or are you incorporating all three, which is not a bad idea, or are you the fourth type that I’m going to talk about? You see where real breakthroughs happen on a surface level as we help our clients overcome their obstacles. You help them overcome obstacles as they go from here to there with whatever it is that you provide, your service, your program, your product. It’s the obstacles. There are two layers deep of just the surface obstacles that I want to hit on that will make a huge shift in your business overall, no matter what it is that you do. Number one are the beliefs. The great coaches in the world, they move away from the surface level of coaching, opportunities to working on opening the door, bridging the gap. Helping people get unstuck around their beliefs. When’s the last time you had a coach that helped you overcome and hit your breakthroughs, but they were able to help you re-shift your beliefs that anything is possible? That you went from being dependent maybe on them and their program, their product or service to being independent, being free to be yourself? The ultimate freedom, isn’t it being yourself? Which is a great way. Even deeper than beliefs are dealing with some of the inner conflicts, which sometimes people don’t like to talk about. We all have issues. We have ups and downs. Great Coach: The great coaches in the world move away from the surface level of coaching and help people get unstuck around their beliefs. Tony Robbins talks about three things. He talks about state, he talks about story, and he talks about strategy. What’s the story of why you do what it is that you do or react to the things that you do the way you do? It’s always amazing because you can have two exact opportunities that come up and one person will go out and get amazing success or results and another person will fall by the wayside or an opportunity will happen, or an occurrence will happen and one person will be eternally optimistic about it and have a positive outlook and another person looks at it like the sky is falling. What does that have to do with inner conflict? As a coach, as an advisor, as an influencer, what I hope that you’ll take from this is number one, as you look to work and help your clients get from where they are to where they want to go in the breakthrough, the outcome, the transformation experience with you, you’re bridging the gap. You can be these types of coaches, but I encourage you, I challenge you to go deeper not only on yourself. It starts with you and me internally. We’re only going to grow to the extent we do but work on those beliefs with your clients and go deeper and help them break, get unstuck, be able to see the blind spots as it relates to those inner conflicts and help them break through and that’s ultimate freedom. That’s what it’s all about being able to help people to be able to go out and make a difference, to have an impact, to contribute at a deep level. If you’d like to go deeper with us, you can do that through a couple of different ways. Number one, we have an ongoing on-demand training program that rotates and you can go check that out at ChampionBusinessBlueprint.com. I encourage you to take action with what we’ve shared. 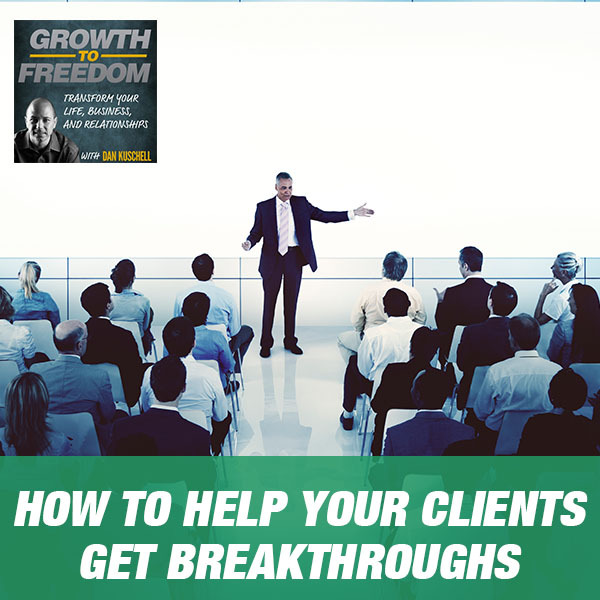 We shared with you how to help your clients get breakthroughs, how to go deeper than the surface level coaching that most do, and this applies whether you’re at home, whether you’re in business, relationships and all those sorts of things. Take action with what you’ve been given.